Cooper came to us as an owner surrender. She once belonged to an older gentleman. It was said that he had other dogs, but yet, Cooper was dog aggressive and was too much for him to handle with her high energy needs. He took Cooper to his vet to have her euthanized and his vet refused and asked if he could have time to reach out to a rescue. He reached out to us asking for help that the owner had given them a week to find her a rescue to take her. At the time we were full but, a boarding facility agreed to board her for us until we could make room here at our ranch. We took her in and just fell in love with her. Boy are we glad she didn't get euthanized and the vet was able to reach out to us. Cooper hasn't shown us aggression towards other animals but she would prefer to be an only animal. She has never tried to lunge out or act out while walking her on a leash around other dogs, but, we can tell she prefers to not "hang out" with other dogs. She prefers to have all the human attention to herself. She is a very high play driven dog and would thrive in an active home. A family that could take her on jogs, or hiking, long walks. She LOVES her toys and there is very rarely a moment where she is not carrying her toy around with her! 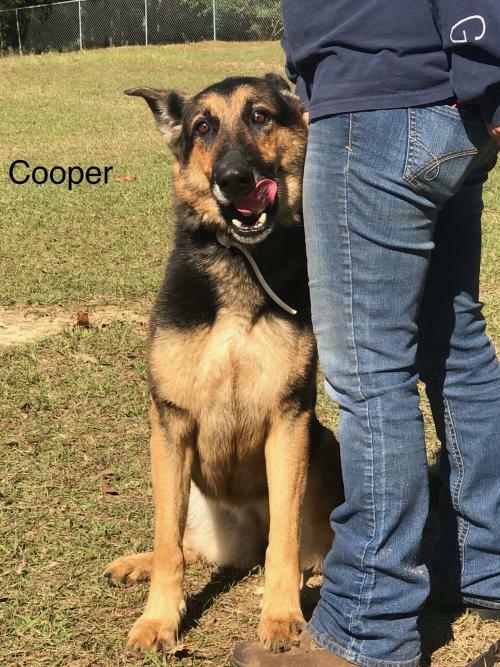 So if you do not have another dog and you are looking for a mature and active dog, then Cooper is your girl!!! Contact us to schedule a meet and greet with this sweet smart and very loyal friend!